The Polish police never ceases to surprise. Another administrator of ToRepublic forum was detained by the police. This time it was Polsilver, who six months ago stole money from Plus Bank. This is a three-part story. You are reading part number three. Here are the links for part one and part two. Only 2 out of 5 administrators are still free. A few months ago, the most popular forum of cybercriminals, ToRepublic, available exclusively on Tor network, had 5 administrators. Now (at the beginning of October 2016) we know that the police have identified and arrested three of them. Apart from Kyber, arrested in February, and The Venom, the police detained 33-year-old Tomasz G., known as Polsilver. Polsilver was detained for three months, confessed to the charges during the interrogation, and gave extensive explanations. According to our sources, Polsilver was one of the most important providers of bank accounts registered on bogus holders. Polsilver dealt mainly with setting up fake accounts, cloning them in other banks (by using the possibility of opening an account remotely), and making them available to other criminals by transferring stolen funds. His activities were very important for the functioning of the forum, oiling the modes of the criminal machine. Detaining Polsilver must be a real celebration for the police chasing cybercriminals – without a doubt, his story of collaboration with partners will be very interesting. Also the testimony of Polisilver on braking into Plus Bank will be interesting. He demonstrated his connection with the burglary many months ago – the description of the burglary, stolen customer data, and ransom demands were published on TorRepublic from his account. We learned that during the interrogation he confessed to complicity in the attack. We are awaiting further developments. 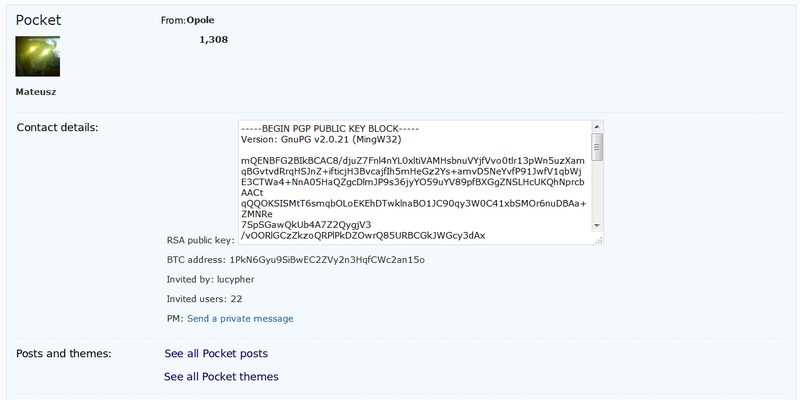 Update: Interestingly, the profile of one of the moderators, Pocket, has changed. It suggests that his name is Mateusz and he comes from Opole. Update2: Another user has changed his description on the forum – this time xyj has been described as fiat126pteam, who has also changed his user icon.